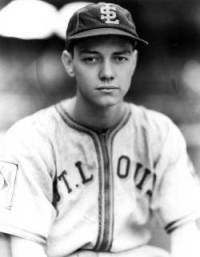 Bob Neighbors of the St. Louis Browns appeared in seven big league games, totaling two hits in 11 plate appearances in 1939. One of those hits was the 21-year-old’s lone career home run, a solo shot to left at Fenway Park on Sept. 21 against Denny Galehouse. An estimated 598 fans saw the rookie’s first hit. Fellow rookie Ted Williams, playing for the Red Sox, went 0-for-4 in the game Boston won 6-2. Nearly thirteen years later, on Aug. 8, 1952, Neighbors, at age 34, was shot down during the Korean War. He was listed as missing in action and later declared dead. Neighbors was the only major league player killed in the Korean War. Williams survived a crash-landing after his jet was hit during a bombing run.